Peter Lawrence, a developmental biologist who is also an editor at the journal Development and former editorial board member at Cell, has been publishing papers in academic journals for 40 years. His first 70 or so papers were "never rejected," he says, but that's all changed. Now, he has significantly more trouble getting articles into the first journal he submits them to. "The rising [rejections] means an increase in angry authors." Lawrence, based at the MRC Laboratory of Molecular Biology at Cambridge, UK, says his earlier papers were always published because he and his colleagues first submitted them to the journals they believed were most appropriate for the work. Now, because of the intense pressure to get into a handful of top journals, instead of sending less-than-groundbreaking work to second- or third-tier journals, more scientists are first sending their work to elite publications, where they often clearly don't belong. Consequently, across the board, editors at top-tier journals say they are receiving more submissions every year, leading in many cases to more rejections, appeals, and complaints about the system overall. "We reject approximately 6,000 papers per year" before peer review, and submissions are steadily increasing, says Donald Kennedy, editor-in-chief of Science. "There's a lot of potential for complaints." Everyone, it seems, has a problem with peer review at top-tier journals. The recent discrediting of stem cell work by Woo-Suk Hwang at Seoul National University sparked media debates about the system's failure to detect fraud. Authors, meanwhile, are lodging a range of complaints: Reviewers sabotage papers that compete with their own, strong papers are sent to sister journals to boost their profiles, and editors at commercial journals are too young and invariably make mistakes about which papers to reject or accept (see Truth or Myth?). Still, even senior scientists are reluctant to give speci. c examples of being shortchanged by peer review, worrying that the move could jeopardize their future publications. So, do those complaints stem from valid concerns, or from the minds of disgruntled scientists who know they need to publish in Science or Nature to advance in their careers? "The rising [rejections] means an increase in angry authors," says Drummond Rennie, deputy editor at Journal of the American Medical Association (JAMA). The timing is right to take a good hard look at peer review, which, says Rennie, is "expensive, difficult, and blamed for everything." What's wrong with the current system? What could make it better? Does it even work at all? Editors at high-impact journals are reporting that the number of submissions is increasing every year (see "Facts and Figures", the table below). Researchers, it seems, want to get their data into a limited number of pages, sometimes taking extra measures to boost their success. Lately, academia seems to place a higher value on the quality of the journals that accept researchers' data, rather than the quality of the data itself. In many countries, scientists are judged by how many papers they have published in top-tier journals; the more publications they rack up, the more funding they receive. We presented three common complaints about peer review at top-tier journals to editors at some of those journals. Here are their responses. Consequently, Lawrence says he believes more authors are going to desperate measures to get their results accepted by top journals. An increasing number of scientists are spending more time networking with editors, given that "it's quite hard to reject a paper by a friend of yours," says Lawrence. Overworked editors need something flashy to get their attention, and many authors are exaggerating their results, stuffing reports with findings, or stretching implications to human diseases, as those papers often rack up extra references. "I think that's happening more and more," Lawrence says. In fact, in a paper presented at the 2005 International Congress on Peer Review and Biomedical Publication, a prospective review of 1,107 manuscripts submitted to the Annals of Internal Medicine, British Medical Journal (BMJ), and The Lancet in 2003 showed that many major changes to the text demanded by peer review included toning down the manuscript's conclusions and highlighting the paper's limitations. This study suggests that boosting findings may cause more problems by overburdening reviewers even further. Indeed, sorting through hype can make a reviewer's job at a top journal even more difficult than it already is. At high-impact journals, reviewers need to judge whether a paper belongs in the top one percent of submissions from a particular field - an impossible task, says Hemai Parthasarathy, managing editor at Public Library of Science (PLoS) Biology. Consequently, editors and reviewers sometimes make mistakes, she notes, perhaps publishing something that is really in the top 10%, or passing on a really strong paper. To an outsider, this pattern can look like "noise," where some relatively weak papers are accepted when others aren't, inspiring rejected authors to complain. But, it's an inevitable result of the system, she notes. Despite a lack of evidence that peer review works, most scientists (by nature a skeptical lot) appear to believe in peer review. It's something that's held "absolutely sacred" in a field where people rarely accept anything with "blind faith," says Richard Smith, former editor of the BMJ and now CEO of UnitedHealth Europe and board member of PLoS. "It's very unscientific, really." Does it even work at all? Indeed, an abundance of data from a range of journals suggests peer review does little to improve papers. In one 1998 experiment designed to test what peer review uncovers, researchers intentionally introduced eight errors into a research paper. More than 200 reviewers identified an average of only two errors. That same year, a paper in the Annals of Emergency Medicine showed that reviewers couldn't spot two-thirds of the major errors in a fake manuscript. In July 2005, an article in JAMA showed that among recent clinical research articles published in major journals, 16% of the reports showing an intervention was effective were contradicted by later findings, suggesting reviewers may have missed major flaws. Some critics argue that peer review is inherently biased, because reviewers favor studies with statistically significant results. Research also suggests that statistical results published in many top journals aren't even correct, again highlighting what reviewers often miss. 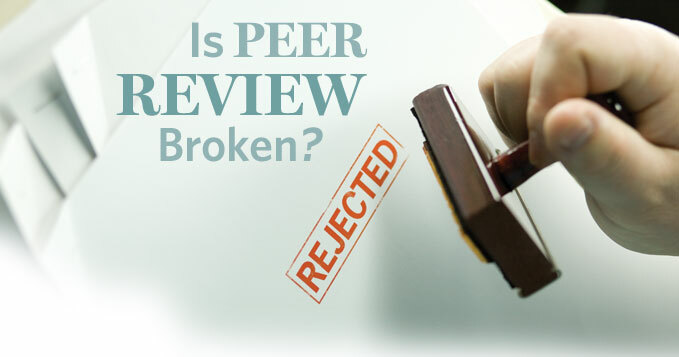 "There's a lot of evidence to (peer review's) downside," says Smith. "Even the very best journals have published rubbish they wish they'd never published at all. Peer review doesn't stop that." Moreover, peer review can also err in the other direction, passing on promising work: Some of the most highly cited papers were rejected by the first journals to see them. The literature is also full of reports highlighting reviewers' potential limitations and biases. An abstract presented at the 2005 Peer Review Congress, held in Chicago in September, suggested that reviewers were less likely to reject a paper if it cited their work, although the trend was not statistically significant. Another paper at the same meeting showed that many journals lack policies on reviewer conflicts of interest; less than half of 91 biomedical journals say they have a policy at all, and only three percent say they publish conflict disclosures from peer reviewers. Still another study demonstrated that only 37% of reviewers agreed on the manuscripts that should be published. Peer review is a "lottery to some extent," says Smith. Statistics are from editors at Journal of the American Medical Association (JAMA), Public Library of Science (PLoS) Biology, Science, Nature, and the New England Journal of Medicine (NEJM). The Scientist also contacted editors at Cell, The Lancet, and the Proceedings of the National Academy of Sciences; all declined to comment. JAMA 6,000 major manuscripts in 2005, a doubling since 2000. Approximately 6%. Close to two-thirds are rejected before peer review. All papers that are eventually accepted are first presented and discussed at a twice-weekly manuscript meeting, attended by the editor-in-chief, other decision-making editors, and statistical editors. In addition to scientific rigor, the journal triages submissions according to importance and to ensure subject has general medical interest. before review. There are 25 decisionmaking editors; the age range is 40-70. PLoS Biology Doubled in the last six months. ~15%, this fluctuates wildly because publication is so new. Each paper has a hybrid team of one academic and one professional editor. Most reviewers are asked to complete reviews within seven working days. Editorial board contains ~120 members. Science 12,000/yr, increasing "at a rate of growth rivaling the rate of Chinese economic growth," says editor Don Kennedy. <8%, about half are rejected before peer review. Papers reviewed by an editor and two members of the board of reviewing editors before peer review. Most reviewers are asked to return comments within one to two weeks. Editorial board contains ~120 members (26 PhD editors). Nature Cell Biology Increasing by 10% each year. All Nature journals have an acceptance rate of less than 10%. Each editor sees an average of 470 papers per year. Besides scientific rigor, the journals look for general interest (especially at Nature), conceptual advance, and breadth/scope of study. NCB has four editors; Nature journals have no editorial boards. New England Journal of Medicine Received 5,000 submissions in 2005, as of press time. Submissions increase 10% to 15% each year. 6% of submissions are eventually published, approximately 50% of papers are rejected before peer review. A deputy editor must approve the assigned editor's decision to reject before review. Other than scientific rigor, editors judge submissions according to "suitability and editorial consistency," says editor Jeffrey Drazen. For instance, the journal does not publish animal studies. The average age of editors is in the mid-50s. The age range is 40-78. There are 10 deputy editors and 10 associate editors. A number of editors are working to improve the system. In recent years, BMJ has required that all reviewers must sign their reviews. All comments go to the authors, excluding only "very confidential information," says Sara Schroter, research coordinator at BMJ, who has studied peer review. Different studies have shown conflicting results about whether signed reviews improve the quality of what's sent back and detected only minor effects, Schroter notes. One report presented at this year's Peer Review Congress showed that, in a non-English-language journal, signed reviews were judged superior in a number of factors, including tone and constructiveness by two blinded editors. However, another study published in BMJ in 1999 found that signed reviews were not any better than anonymous comments, and asking reviewers to identify themselves only increased the chance they would decline to participate. Still, Schroter says the journal decided to introduce its policy of signed reviews based on the logic that signed reviews might be more constructive and helpful, and anecdotally, the editors at BMJ say that is the case. JAMA's Rennie says he doesn't need research data to tell him that signing reviews makes them better. "I've always signed every review I've ever done," he says, "because I know if I sign something, I'm more accountable." Juries are not anonymous, he argues, and neither are people who write letters to the editor, so why are peer reviewers? "I think it'll be as quaint in 20 years' time to have anonymous reviewers as it would be to send anonymous letters to the editor," he predicts. But not all editors agree. Lawrence, for one, says he believes anonymity helps reviewers stay objective. Others argue that junior reviewers might become hesitant to conduct honest reviews, fearing negative comments might spark repercussions from more seniorlevel authors. At Science, reviewers submit one set of comments to editors, and a separate, unsigned set of comments to authors - a system that's not going to change anytime soon, says Kennedy. "I think candor flourishes when referees know" that not all their comments will reach the authors, he notes. Indeed, in another study presented at this year's peer review congress, researchers found that reviewers hesitated to identify themselves to authors when recommending the study be rejected. Nature journals let reviewers sign reviews, says Bernd Pulverer, editor of Nature Cell Biology, but less than one percent does. "In principle" signed reviews should work, he says, but the competitive nature of biology interferes. "I would find it unlikely that a junior person would write a terse, critical review for a Nobel prize-winning author," he says. However, since BMJ switched to a system of signed reviews, Smith says there have been no "serious problems." Only a handful of reviewers decided not to continue with the journal as a result, and the only "adverse effect" reported by authors and reviewers involved authors exposing reviewers' conflicts of interest, which is actually a "good thing," Smith notes. Another option editors are exploring is open publishing, in which editors post papers on the Internet, allowing multiple experts to weigh in on the results and incrementally improve the study. Having more sets of eyes means more chances for improvement, and in some cases, the debate over the paper may be more óinteresting than the paper itself, says Smith. He argues that if everyone can read the exchange between authors and reviewers, this would return science to its original form, when experiments were presented at meetings and met with open debate. The transition could transform peer review from a slow, tedious process to a scienti . c discourse, Smith suggests. "The whole process could happen in front of your eyes." However, there are concerns about the feasibility of open reviews. For instance, if each journal posted every submission it received, the Internet would be . ooded with data, some of which the media would report. If a journal ultimately passed on a paper, who else would accept it, given that the information's been made public? How could the journals make any money? There's an argument for both closed and open reviews, says Patrick Bateson, who led a Royal Society investigation into science and the public interest, "and it's not clear what should be done about it." Many authors are now recommending that editors use (or avoid) particular reviewers for their manuscripts; and some research suggests this step may help authors get their papers published. An abstract at the last Peer Review Congress reported that papers were more likely to be accepted if authors recommended reviewers, or asked that certain reviewers not participate. Kennedy, for one, says he believes it's "perfectly respectable" for authors to bar reviewers, although he says he does not always adhere to authors' requests, such as occasions when authors in particularly narrow specialties submit an overly long list of reviewers to bar. Lawrence suggests that, to ease the current publishing crunch, senior scientists should occasionally submit their studies to lesser journals. However, he says he's tried this tactic, and it "hasn't helped [his] career any." Consequently, there should be major changes in how work is evaluated, he says, so researchers are not penalized for publishing in second- or third-tier journals. Anecdotally, Parthasarathy says this is already happening. In some cases, scientists who are being evaluated simply submit their top three papers, instead of counting the number of high-impact submissions. She adds that one of the purposes of open access (the founding principle of PLoS) is to change the all-importance of where people publish. If every scientist has access to papers, she says, they can judge the paper by its contents, not just its citation. "We have to get away from [the idea that] where the paper is published [is] the be all and end all," Parthasarathy says. Despite the number of complaints lodged at peer review, and the lack of research to show that it works, it remains a valued system, says Rennie. Scientists sigh when they're asked to review a paper, but they get upset if they're not asked, he notes. Reviewing articles is a good exercise, Rennie says, and it enables reviewers to stay abreast of what's going on. Peer review "has many imperfections, but I think it's probably the best system we've got," says Bateson. Experts also acknowledge that peer review is hardly ever to blame when fraud is published, since thoroughly checking data could take as much time as creating it in the . rst place. Still, Pulverer says he has seen reviewers work on papers to the point where they deserve to be listed as coauthors. "I think everyone in biology would agree that peer review is a good thing," he says. "I would challenge anyone to say it hasn't improved their papers." Correction (posted February 9): When originally posted, this package of stories contained two errors. Due to a production error, the JAMA acceptance rate in "Facts and Figures" read approximately 55% rather than 5.5%. According to JAMA, the figure is "about 6%." In addition, the related article "What about fast-track?" reported that the International Congress on Peer Review and Biomedical Publication happens every year. The Congress takes place every four years. The Scientist regrets these errors.